One of the most exciting features in Harmony is the multiplane or Z-depth. In the multiplane, you can create backgrounds in several layers, spread them on the Z-axis to add depth, and then move the camera through this environment to create an impressive perspective illusion. In live action, when the camera moves around in a scene, objects near the camera will appear to move by a greater distance than objects far from the camera. In 2D animation, multiplanes can be used to achieve a similar effect without having to use 3D. 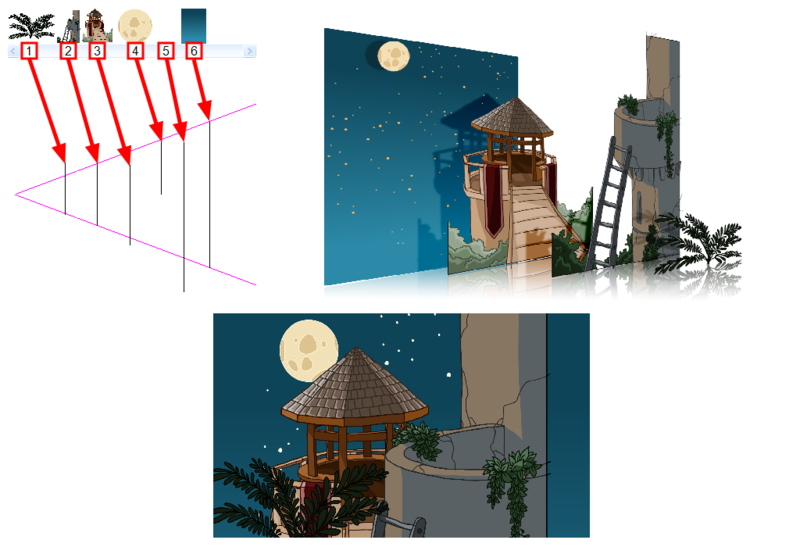 In Harmony, a multiplane can be easily achieved by creating a scene's background over several layers, and positioning them at different depths relative to the camera. 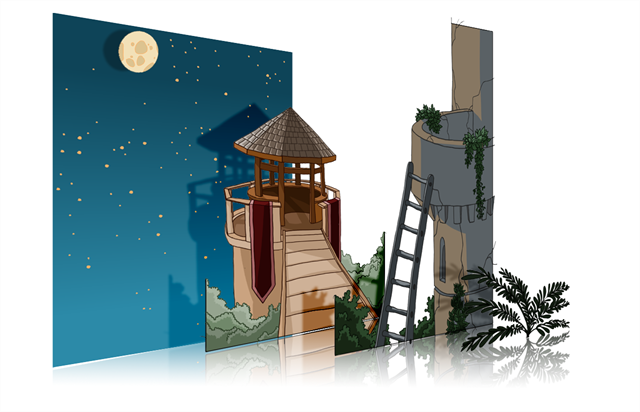 Before creating a multiplane, make sure you have a proper understanding of the environment in which your scene happens. Picture what your scene's background would be like in 3D, then image the camera moving through the space, and how the objects in the picture move at different speeds depending on where they are in relation to the camera lens. In the following example, the background is made of 6 different layers, each picturing an object that is at a different distance from the camera. On the left, you can see how each object is positioned relative to the camera, as if you were looking at them from the side. On the right, you can see how layers are positioned relative to each other as if you were looking at the scene from a corner. Below, you can see the scene from the camera's point of view. NOTEWhen creating a multiplane background, it is important to draw each layer fully. Even if some parts of a background layer is hidden behind a foreground layer in the camera's initial position, panning or zooming the camera may expose parts of background layers that are not initially visible. In order to move a layer further from or closer to the Camera, you must change its position on the Z-axis. You can do this by moving a layer using the Transform Tool in the Side or Top views. You can also move a layer on Z-axis directly from the Camera View by holding Alt and dragging the layer up or down. Positioning your element closer to the camera makes them appear bigger, and moving them further makes them appear smaller. It is also possible to move elements on the Z-axis without affecting their apparent size by using the Maintain Size tool in the Advanced Animation toolbar. It is a good idea to keep a Camera view open to see what your scene looks like while positioning elements in the Top and Side views—see Top View and Side View. NOTEJust like with other transformations, transformations on the Z-axis on a parent layer will also affect the apparent position on the Z-axis of its child layers. Therefore, a child layer's apparent position on the Z-axis can be affected by any of its parents.